There has been a constant transformation in the mobile app development trend. As we know, there's nothing permanent as "constant change", and this is playing an important role in our day-to-day lives in form of web and mobile applications. We need the apps for every single task. For instance; booking a cab via Uber, ordering food online through Zomato or seeking for a place to rent on Airbnb. From the past few years, accompanying great changes, the mobile apps are becoming a powerful source to execute the regular tasks in a more simplified and easy manner. Considering the basic to the complex nature of the users, the Mobile Application Development is executed to offer more personalized solutions to their users. In order to win the application development industry, it's imperative to offer application development services based on the hottest upcoming in the mobile app development trends. 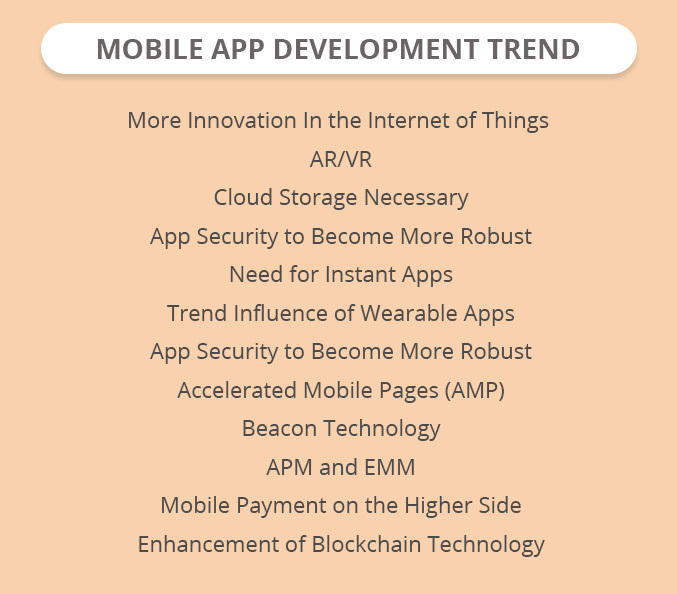 Based on the present situations, the activities carried, tools, technologies, and trend, the researchers refine the major updates in mobile app development trends 2019. Let's have an insight on how integrating these emerging technologies can help deliver the ultimate user experience. The buzz of the Internet of Things is already strong around the world and will continue to shape-up more business with smart and connected devices. It has boosted diverse industry verticals that include healthcare, e-commerce, hotel, construction, and transportation, etc. and it is enhancing the ecosystem with its invasion in the retail industry, real estate, and development of smarter cities. Many experts expect that IoT will successfully resolve the menace of traffic snarls and vehicle parking issue. The IoT is further creating a boom in educational institutions by connecting teachers, students, and parents. Healthcare is another sector to be greatly benefited from IoT. Medical Internet of Things is evolving and will immensely expedite both doctors and the patients. Further, one of the important aspects of IoT in 2019 will be the collaboration with the automation of the enterprise operations. Another phase to hit the development will be AR and VR technology. In recent years, the technology has indeed created a huge influence over the audience. The futuristic AR and VR technology is augmenting the popular advanced gaming apps, and successfully created a hype around the social media platforms. The recent instance that - Pokémon Go based on the AR technology. Further, social media giants like Instagram and Snapchat are implementing this innovation, resulting in user engagement Surg. Ar- Considered As The Best Tool For A Social Media Campaign. 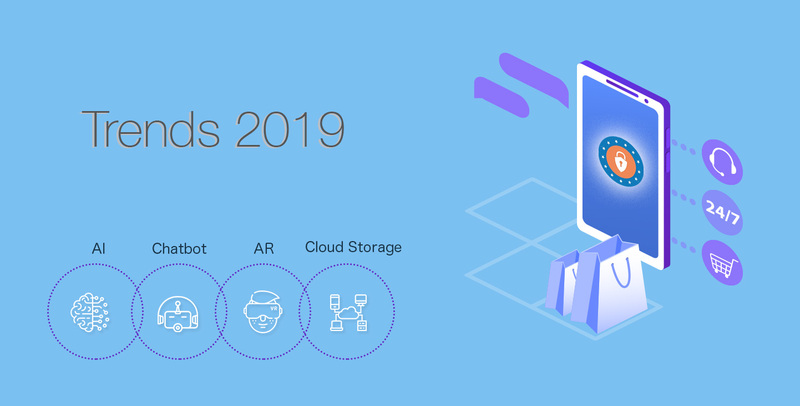 According to Statista, the global market of AR and VR technology will explode drastically up from $27 billion dollars in 2018 to about $209 billion in 2022. At present, on-demand apps are gaining huge popularity, therefore Chatbot Development Company are emphasizing to bring the best out of it - as chatbots are an integral part as it concedes quick response in real-time with customers. Some survey reveals that the Chatbot market will increase to 1250 million by the year 2025. Unquestionably, Chatbots will be equated with the AR and VR technologies to bring out better services for business enterprises. They have played a crucial role in intensifying customer relationship management to a next level. AI has successfully conceived a huge influence simplifying the services and the demand process. Further collaborated with machine learning, it empowers any business to soar high with valuable data and real-time analytics. International Data Corporation indicated that the AI industry will establish a new benchmark by extending up to $40 billion by the end of the year 2020. AI as technology has been a hit launch and machine learning will slowly but join the technology track suitably through numerous of its components. The instant apps came into existence in 2016, however, owes commendable popularity. As the native mobile apps do not need to get the download, the phone memory is free. They are user-friendly and convenient and can be shared with friends. Examples of instant apps - New York Times Crossword, Buzzfeed, Red Bull TV, and Onefootball etc. The dominance of the on-demand apps to various industry verticals and sectors in the mobile app world cannot be neglected. The important can be witnessed by the upsurge in the numbers in the time to arrive in 2019 and even after that. As the times are advancing cloud storage will become a necessity. The cloud-based app is gaining importance as they offer mobile app security, cloud management as there are certain limitations on storage in the devices. Indeed, the mobile applications are an indispensable part of people’s lives as we are performing most of our task using apps such as purchasing, ordering food, booking tickets, cab and meal, banking and even checking out properties, and also the important health parameters. Thus, it has become necessary for the mobile app development company to attract more user base with unique, inspiring, convenient, and user-friendly apps. Root Info Solutions is a technology first mobile app development company - aim to help enterprises transform digitally and meet customer expectations. To know how to implement the development trend in your upcoming project please feel free to contact our app developers today.